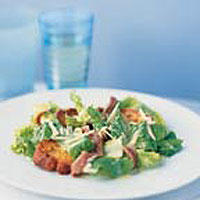 You can make the dressing and croutons several hours before serving. Cover the croutons and chill the dressing until you're ready to make up the salad. Preheat the oven to 190°C, gas mark 5. For the croutons, toss the bread in a mixture of the olive oil and crushed garlic and spread over a baking sheet. Cook for 15-20 minutes until golden and crisp. Leave to cool. Tear the lettuce into bite-sized pieces and place in a salad bowl. To make the dressing, whisk the lemon juice and Worcestershire sauce with the garlic, mustard and seasoning. Whisk in the mayonnaise, then gradually whisk in the oil until the dressing is thick and creamy. Add the dressing to the lettuce and toss. Add the Parmigiano-Reggiano, anchovies and croutons and toss lightly. Serve immediately. For a more substantial salad, add in a chopped 220g pack of Waitrose 2 Roast Chicken Breast Fillets and 2 Hass avocado pears, peeled, stones removed and chopped. Toss lightly to mix.